Boba - Raskršće - Lečenje bolesti zavisnosti. Lečenje narkomanije. 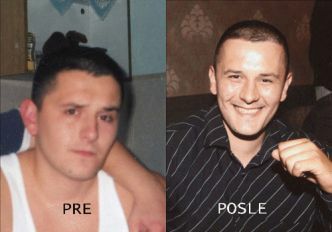 My name is Borislav, I am 29 years old and I am from Novi Sad. In my early teenage years I started coming into contact with different drugs, and when I was 17 years old I became an intravenous heroin addict. I got involved in crime, cheating and stealing from others just to get money to buy my daily dose. Deep down I knew I wanted to quit doing those things and to start a life without drugs, but that desire was not as strong as the desire for heroin. I spent the next 9 years trying to quit using drugs and, after various ups and downs, I still failed to get permanently free. Some of my old friends who I took drugs with went through the Teen Challenge program, and I saw that they had changed and started to live a totally different life. That attracted me and in 2007 I entered the Teen Challenge program. I met God in the program and found out that it is possible to get another chance and to live a new and fulfilled life. After 18 months, I successfully finished the program! Three years have passed since I finished the program, and since then I have lived a totally different way of life. Now I am happily married, with a wife who loves ma and supports me, and whom I can rely on. Also I have started a private cabinetmaking business, a good job that provides me with decent money. In my business, through working with people, I have gained a reputation where people trust me again. I have a clean vidion for the future; my plans are to grow my family and to develop my business. Also, I have started to go to Bible school and at weekends I volunteer at the Men’s Rehabilitation Center in Teen Challenge. I am happy now, filled with hope, with a smile on my face! God set me free from drugs forever and I believe that my life is now going in just one direction, which is full of hope for good future!